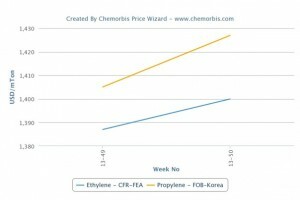 Spot ethylene and propylene prices posted increases in Asia this week as per the pricing service of ChemOrbis. Tight supply in the region was cited as the main reason behind higher prices while spot naphtha prices on a CFR Japan basis are not suggesting major changes from last week. Spot ethylene prices on a CFR Northeast Asia basis climbed $35/ton on the week. 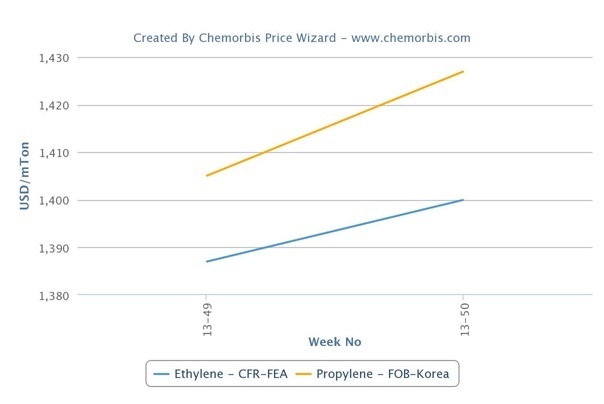 Spot deals for propylene were also concluded with increases of $30/ton on a CFR China basis and $25/ton on an FOB South Korea basis. The tightness in ethylene and propylene availability is expected to remain in place throughout the first quarter of 2014 due to a number of planned maintenance shutdowns in the region. Japan’s Asahi Kasei is planning to shut their steam cracker in Mizushima for turnaround in February next year. The 470,000 tons/year plant is expected to remain offline for 55 days. Japan’s Showa Denko is expected to start a maintenance shutdown at their naphtha cracker in Oita in the middle of March. The 695,000 tons/year cracker is scheduled to remain offline between March 13 and April 25. China’s Shanghai Secco Petrochemical is mulling over shutting their naphtha-fed steam cracker for maintenance in March. The cracker has a capacity to produce 1.1 million tons/year of ethylene and 500,000 tons/year of propylene. Market sources said that the shutdown could take longer than a month and added that the downstream units at the same site may also be shut in line with the cracker. According to ChemOrbis, South Korea’s Lotte Chemical is expected to conduct a brief maintenance at their Daesan cracker in in March. The naphtha-fed steam cracker, which has a capacity to produce 1 million tons/year of ethylene and 500,000 tons/year of propylene, is expected to remain offline for four days. Sources said that the company will also start a four-day turnaround at their Yeosu cracker in May. The Yeosu cracker is able to produce 1 million tons/year of ethylene and 480,000 tons/year of propylene.